Look, this is going to sound harsh. I admit it in advance; and if you have a problem with it, I understand. The issue is Coach K's decision to stay at Duke. More specifically, the reasons he gave for turning down the $8 million a year the Lakers dangled in front of him. We're sure the gang in Chapel Hill aren't pleased with Andrew. Coach K made particular reference to the outpouring of support he received from the Duke community, and he singled out an e-mail from a Duke student named Andrew Humphries, which concluded with the plea, "Please still be my coach." So we are to believe Coach K made his decision at least in part on the basis of an e-mail that sounds like something a kid would write in a letter to Santa Claus. Please still be my coach, a 19-year-old man wrote, and Coach K turned down $40 million over five years? 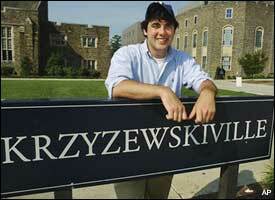 Humphries also wrote, "I got to Duke. And discovered that yes, I am going to play for Coach K. I am going to be his sixth man." With that kind of action working back at Duke, Mitch Kupchak and Kobe the Great had no chance to lure this great man away from the college game. And in related news, Cuba Gooding Jr. immediately signed up to play the role of Humphries in the movie version, tentatively titled "Please, Coach, Please." Pressing question of the week: How many hours of tennis can Roger Federer play before he actually begins to sweat, because he never got to that point in the final against Andy Roddick? Next year, he's going to wear his shorts down real low and let his boxers hang out for all the world to see: Roddick doesn't take himself too seriously, which is a great and rare attribute in the world of individual sports, but can't he please turn his cap the right way -- or take it off altogether -- when he's posing for photographs after a Wimbledon final? Because, when you get right down to it: The last thing the world needs is another Ashton Kutcher. Federer, on the other hand, can be described in one word: Machine. Any thoughts that Kobe Bryant is a narcissist are dispelled by the following news: Teams interested in courting him as a free agent must travel to his home in Southern California to make their pitch. And not only that, but: They have to be summoned first. So this is for you, Gregg Popovich: None of this showing up at the guard house and pretending to be the refrigerator repairman, fumbling around with your clipboard before saying, "Oh, yeah -- it's the Bryant house. Kobe, I think." It looks like a good fit, but it's hard to bend the mind around the entire concept: The Utah Jazz are apparently hot and heavy on the trail of Kenyon Martin. One way you can tell K-Mart is serious about Utah: He went there instead of making them visit him in his crib. Vanessa Williams and Rick Fox are divorcing, and I have only one thing to say: It's shocking, because they always looked so damned perfect together on those Radio Shack commercials. Of course, they'll be the first to tell you they want their children to make their own way in the world and would hate to see them be burdened by their parents' fame: Steffi Graf and Andre Agassi, whose son Jaden is featured along with his parents in a commercial that aired roughly every 5.7 minutes during Wimbledon. Just for the heck of it: Sixto Lezcano. To answer the question, here's one man's countdown of the most impressive baseball streaks: 4.) Cal Ripken's consecutive games played; 3.) Eric Gagne's save streak; 2.) Orel Hershiser's scoreless inning streak; 1.) Joe DiMaggio's 56-game hitting streak. Get ready, because it's going to be the most overplayed angle of the All-Star Game: Mike Piazza catching Roger Clemens. Prediction: Piazza will make nice, complimenting Clemens at every turn, while Clemens will ignore it or say it doesn't matter who holds up the mitt. Unless, of course, you're talking about the business end of a .38 revolver: It's becoming increasingly clear that the word "snub" owes its continued existence solely to the days following all-star selections in each major sport. Ah, the beauty of summer: July means the Tour de France, the event that provides the world with another opportunity to learn about the unappreciated art of breaking wind. And finally, welcome to OLN, the station we like to call The Self-Abuse Network: The Tour can be found every morning on the Outdoor Life Network, which otherwise has a weekday lineup featuring people engaging in 100-mile runs, 40-mile Army crawls and competitive glass eating. Tim Keown is a senior writer for ESPN The Magazine. He is the co-author of the upcoming book "Hunting the Jackal: A Special Forces and CIA Ground Soldier's Fifty-Year Career Hunting America's Enemies," to be published in June by William Morrow.